Carmaker BMW, presented a new restyled sedan 7 series, presenting it traditionally in two forms — standard (G11) and increased (G12) wheelbase. The official premiere took place in September 2015 at the home for the auto giant, Frankfurt Motor Show. Such haste is not typical for Germans restrained, due to the fact that the network has flowed prematurely too much insider information associated with the revolutionary changes in the technical equipment and design models. In addition, there is one more important fact. 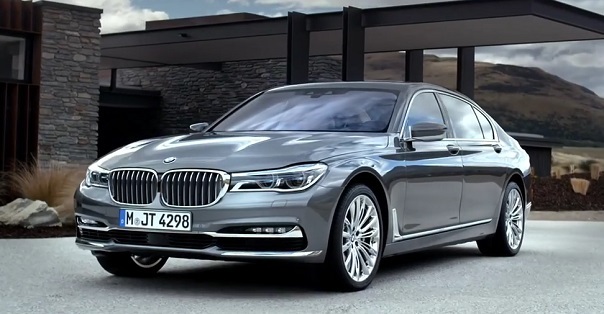 The company does not unreasonably believe that the updated BMW 7 Series car model year 2016-2017 — this is the best that has been created by them for more than a century of existence of the brand and «Seven» is fully capable to eclipse the world presented in 2014 a luxury Mercedes-Benz S-class Maybach in 2016. BMW Mercedes-Benz Eternal opponent is not the only contender for the podium in the segment flagship premium sedan. Ready to upgrade Audi A8, Jaguar XJ and Porsche Panamera II, their first run is scheduled for the end of 2015. Traditionally, S-Class is a platform, where manufacturers show the most modern know-how and the most advanced innovations and the latest achievements of engineering thought, so the competition is very tough talking. 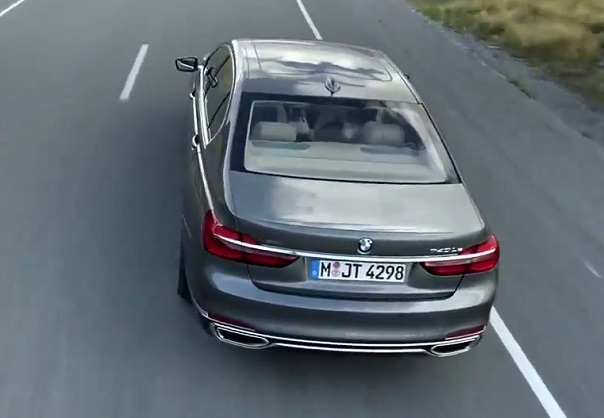 BMW 7 series 6-generation car is really good, showing what technology will operate with the Bavarians in the future and setting new high standards of the automotive industry to his opponents. The conceptual strategy of the new «Seven» from BMW, announced at the presentation of the chief designer of the German group, Adrian van Hooydonk: «We wanted to create a standard of modern luxury and exceed the expectations of our customers.» Of course, a team of engineers who worked on the creation of a leader, it worked! • Remote Control Parking — automatic parking system, which BMW 7 series can be considered the world’s first serial car able to park automatically in a limited parking space or enter (and leave) in a narrow garage without a driver behind the wheel. Remote control of the process is carried out through key touch-screen. • BMW Display Key — an interactive multi-functional device, similar in functionality and appearance on the smartphone, the key can only be called conditionally. It is strange that the Bavarians have not provided the opportunity to call on him. Incidentally, when the key is in the interior, he is charged by a wireless inductive charger (Wireless), from which also can charge your smartphone or tablet. • Sky Lounge LED Roof Panorama — the most romantic option — Panoramic roof with projection of the starry sky 6 variations! Something similar has already demonstrated in the Rolls-Royce, but BMW engineers have managed to create something quite amazing. • iDrive — 6 evolutionary generation multimedia complex, which includes an advanced audio-video system Bowers & Wilkins Diamond Surround Sound, the system supports the circular review function active safety and self-parking, as well as a touch screen, which can be controlled by gestures without touching the screen. • LaserLight — laser lights installed option does not dazzle the eyes of drivers of oncoming cars. Range of laser light rays more than 600m., Which exceeds the same indicator of LED lamps is almost 2 times. 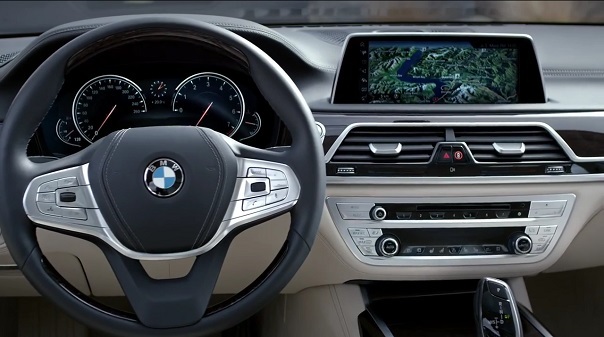 Stylish, solid, elegant appearance premium sedan fresh and relevant at the same time, awareness of the BMW 7 Series is a hundred percent! The prototype of the new Seven has become a luxury concept Vision Future Luxury Concept, and it is built on a new modular platform from which to share later with younger models. The bodywork German engineers for the first time for the S-Class cars, used carbon fiber, which allowed them to release the G11, to reduce weight by 130 kg., Compared to the previous generation, despite the slightly increased dimensions. The standard version of the car became longer by 19 mm (5098) and up to 7 mm (1478). Designers BMW, as in the previous incarnation of the seventh model, managed to maintain the distribution of the axes in a perfect 50/50, which, of course, has a positive effect on the stability of the car and drive charge of the famous legendary sedan. The main emphasis exterior familial New BMW 7 remain proudly inflated twin nostril grille with an adjoining narrowed head optics on the sides. Large hood with stylish, charismatic line, and the lower part of the bumper with integrated foglights, breaks into a smile wide air intake. Feed concise, without undue heaviness, and in harmony with the design of the front of the top models. The interior of the cabin is made in the traditional BMW, Laksheri style minimalism. Ergonomics perfectly calibrated and quality finishing exclusive materials of the highest level. By the progressive changes that have emerged in the space vnutrisalonnoe include electronic 3D dashboard with good graphics and a projection screen. • Lounge Seating — electric drive system for maximum comfort adjustment of the rear seats, which allows including seat behind the front passenger transformed into almost a full-fledged bed. BMW, for 7 models prepared for a wide range of engines from 2.0l base. 4-cylinder engine capacity of 260 hp, a top up to 6.6l. V12 600l.s. Depending on the power unit the car will be assigned to the appropriate label: — for petrol engines 730i, 740i, 750i, 760i and 750i xDrive. — For diesel 730d, 740d, 750d. — For the hybrid version of the 740e. All engines will be aggregated 9-speed transmission. Of course, BMW Group applies a differentiated approach and not all equipment will be available in all markets, as well, and the corporation is not straightforward pricing. Today we know that the price tag for the new’s seven in the United States will start with a mark of 80 000 North American dollars, while sales in the Americas and Europe will start in October 2015.